In this industry the mad holiday season is in full bloom with Christmas and the New Year’s right around the corner, but closely following the rush is a breathe of fresh air for some of us. Which includes a trip to the Anaheim Convention Center from January 15th to the 18th, to be precise. That’s right the National Association of Music Merchants (NAMM) is next month. Throughout the year, hundreds of news releases regarding new music equipment we’ve received are displayed live for people to see. Some of the products are from your favorite brands and companies. 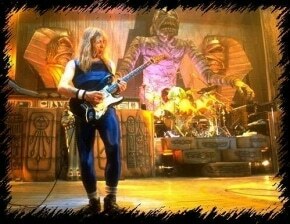 However, a story that is buzzing concerns the soon-to-be-officially-announced brace of new Iron Maiden signature models: the Fender Dave Murray Strat, Steve Harris Precision bass, and Jackson Adrian Smith Signature guitars. We’ve managed to disclose some shots (which are below), although we’re yet to receive official word as to the specifications of the instruments. What’s for sure is that they’ll appear at our site, Gear-Vault.com with a much closer investigation. So, here’s the Dave Murray Strat. We believe it will be a lot like the HST-57DM model which has been available in Japan for a time, we’ll have to wait and see! 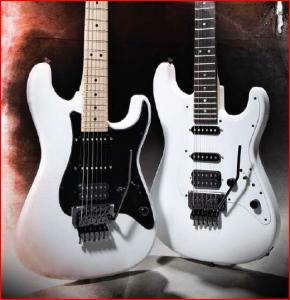 The Jackson Adrian Smith reflects the MIDI’d-up version he used for most of the “Somewhere In Time” / “Seventh Son” album in tour rotations, and you’ll recognize the guitar on the right (in the photo) from the thievery that took place during Iron Maiden‘s tour back in August 2008: the guitar has since been recovered and returned, we hear. 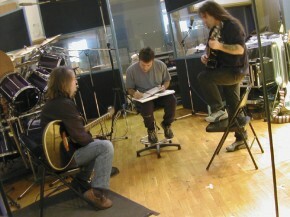 And here (in the bottom photo), for completion’s sake, is a shot of the old Steve Harris IM bass guitar. 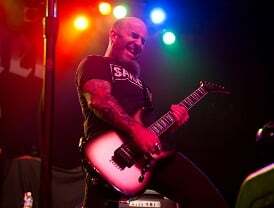 All we know of the newbie is that it too will be finished in metallic blue and it’s likely to offer a Badass bridge and a brace of Seymour Duncan Quarterpounders. More info, once it appears, from Fender Guitars. Stay tuned.